What’s more magical than Mickey Mouse? The sweet smiles and giggles of your goofy baby! What’s not so magical? Trying to transport a bulky play gym from room to room… and don’t even think about storage. With the Mickey Mouse Easy Store Playmat, it’s easier than ever to coax fits of laughter from your little one. Just click the SlimFold toy bar into place to transform this baby mat into a magical play gym that includes 5 toys you can take on-the-go. Lay beside your baby during tummy time as he beams at his reflection in the baby-safe mirror hanging from above. With those iconic mouse ears as a frame, he’ll feel just like Mickey himself. OH BOY! Watch baby’s big smile grow as he plays with the Minnie Mouse bead chaser, or squeaks and squeals with Mickey’s squeaker medallion and rattle. And when playtime is over, you can easily collapse and store the entire baby gym. Now that’s truly magical. 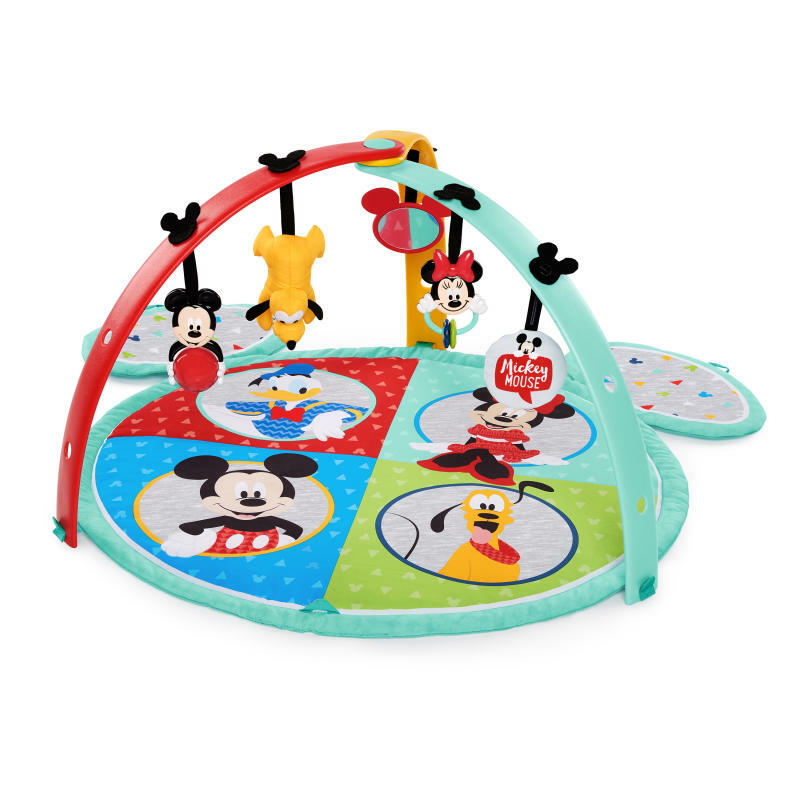 Mickey’s magic packs into an easy-store activity mat! Dimension (in) 40.5" x 40.5" x 19"
Mat – Remove toy bar, toys, and plush toy before washing. Machine wash with cold water and mild soap, gentle cycle; no bleach. Air dry flat.SlimFold™ Toy Bar and toys – Wipe clean with damp cloth and mild soap. Air dry. Do not immerse in water.